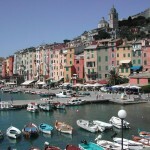 Santa Margherita, San Fruttuoso, Camogli & Portofino,Cinque Terre, Via dell’Amore’, Levanto & Portovenere. 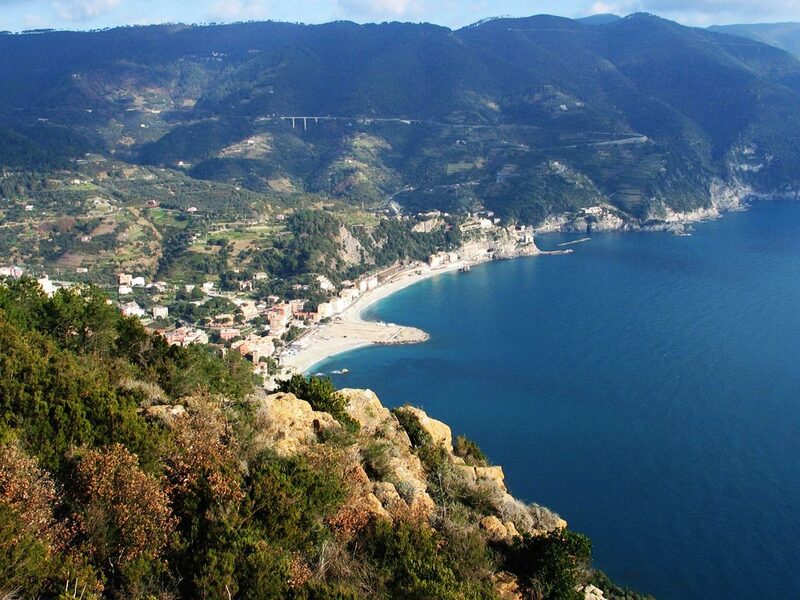 The region of Liguria has some amazing stretches of coastline. Among walkers the amazing Cinque Terre are probably best known, but also around glamorous Portofino there are some beautiful walks to be made. 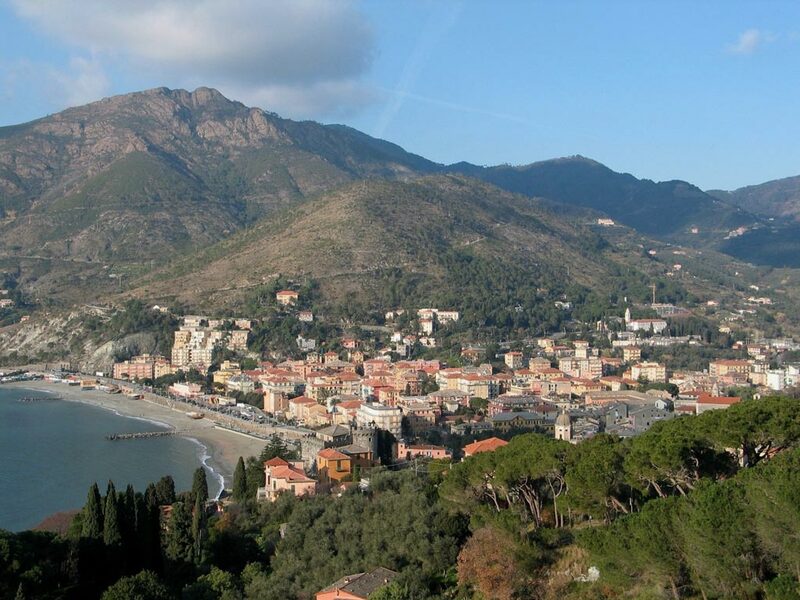 This wonderful tour offers a good mix of great hikes and some good sightseeing, bringing you along the best spots of beautiful Liguria. 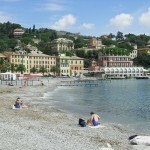 The tour starts from the charming resort of Santa Margherita Ligure. From here we discover the wonderful Peninsula of Portofino, mostly known for the colourful Portofino itself, resort for the Italian jet-set, but with many other treasures to offer! Natural wonders such like the small peninsula with the castle and lighthouse of Portofino and cultural wonders like the abbey of San Fruttuoso, located in an isolated inlet of this beautiful coastline and the coloured postcard village of Camogli. All these treasures are best discovered on foot. 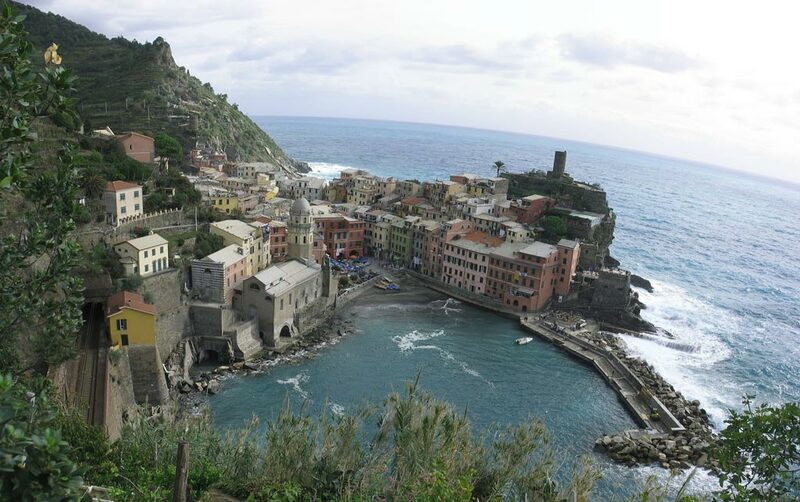 Then we go for a few days of discovery in the Cinque Terre (‘five lands’), which gets its name from the five picturesque villages of Monterosso, Vernazza, Corniglia, Manarola and Riomaggiore. The area, now a major National Park, is a unique part of Italy. For over a thousand years people have lived in this dramatic landscape, slowly altering its features and cultivating the steep hillsides that lead down to rocky shores. An extensive network of ancient mule tracks – today used as footpaths- leads us through an extraordinary landscape of terraces, built by hand with stones and earth. Enjoy the colourful fishing villages, the outstanding food and wine, the fascinating history and vibrant culture of this corner of Italy which has always captivated the traveller. For centuries a favourite haunt of poets and writers, it has been home to generations of simple fishermen and farmers who by their labours have carved a stunningly beautiful landscape from the seaside cliffs. With every inch of space at a premium the houses appear to be built one atop the other, and the terraced vineyards and olive groves, connected with a maze of paths, offer some of the most spectacular walking to be had in Italy. On this tour, we take you beyond the crowds to experience the hidden treasures and authentic culture of this Italian paradise. 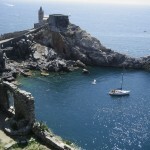 You will discover the hidden charm of Genova, and the hidden tracks of the Portofino Peninsula. 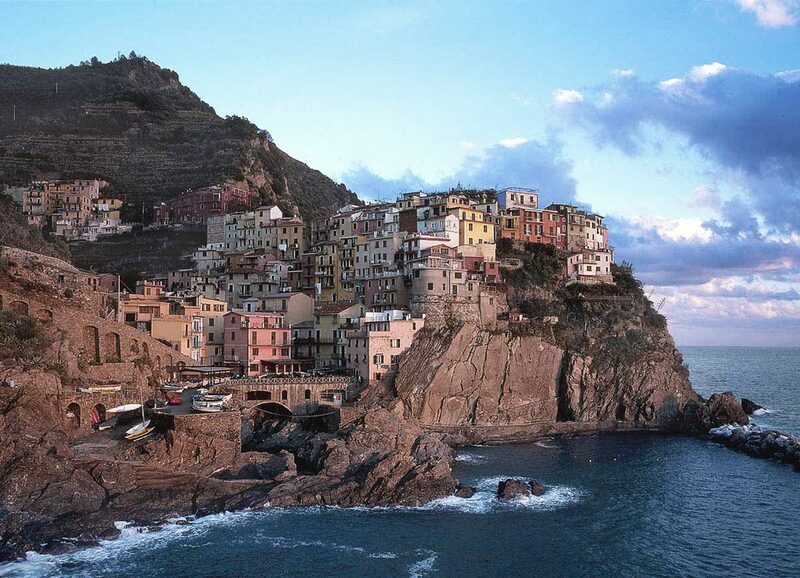 And you’ll see that with reason the Cinque Terre have become such a popular destination, but as well that it takes only a little effort to get ‘off the beaten track’. Only a few hundred metres away from the crowds, you will find yourself surrounded by nature, suspended between vineyards and the turquoise Mediterranean. You’ll discover a real Italian paradise. Please note: this is a moderately easy tour which is suitable for those who have some experience with walking and a good general physical condition. Most of the walks are on good paths, some of them just recently restored by the local authorities. Average walking times: approx from 4 to 5 hours each day. 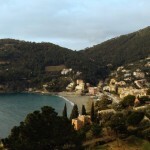 Arrival in Santa Margherita Ligure – or close by – in case you want some extra time here. Several hotels can be booked, according to your wish (either ‘downtown’ centrally located, or near the harbour or train station, ranging from 3 to 5-star. Of course the hotel used on Sunday night is recommended). 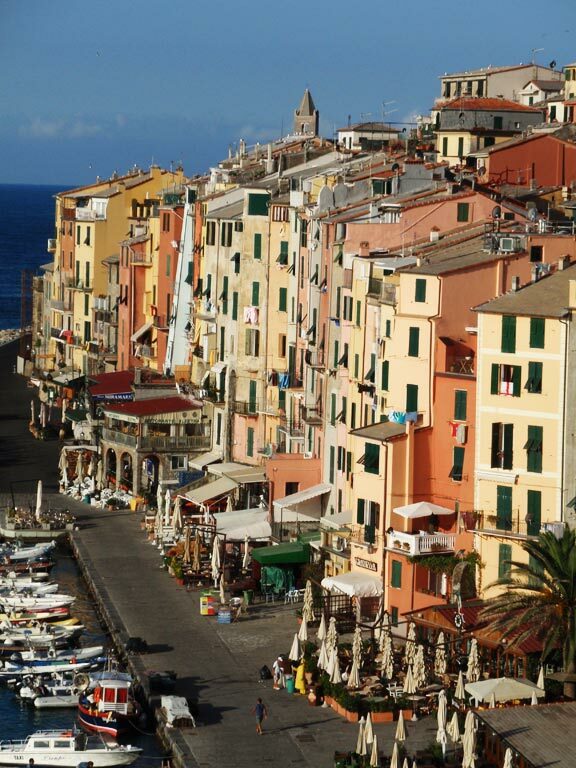 From Genova, Pisa and La Spezia (and many other cities) there are regular trains to Santa Margherita – Portofino. Today you arrive in the charming Santa Margherita Ligure, gateway to Portofino, one of the most beautiful small towns on the Ligurian coast. After settling in your centrally located hotel, you can take your time to wander around through the colourful historic centre and have a relaxed drink or grab a gelato on one of the many terraces. In the afternoon we’ll meet with our guide and if time allows we already go for a stroll to explore the town or enjoy a drink. In the evening we dine in a very nice restaurant close to our hotel. 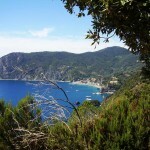 In the morning we start a relaxed walk onto the western part of the Portofino peninsula. 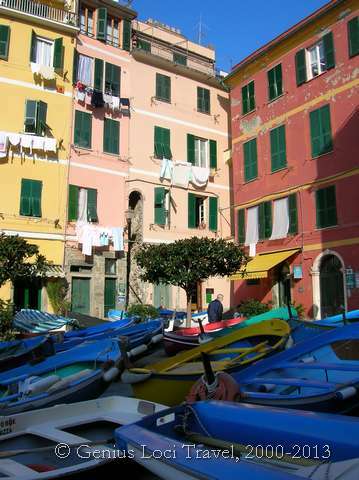 A 5-minute train ride brings us to the colourful Camogli, the ‘City of the 1000 white sails’. The walk takes us along the hamlet of San Rocco, a good spot to drink a coffee and buy some lunch, for example one of the best ‘focaccia’s’ of the area. 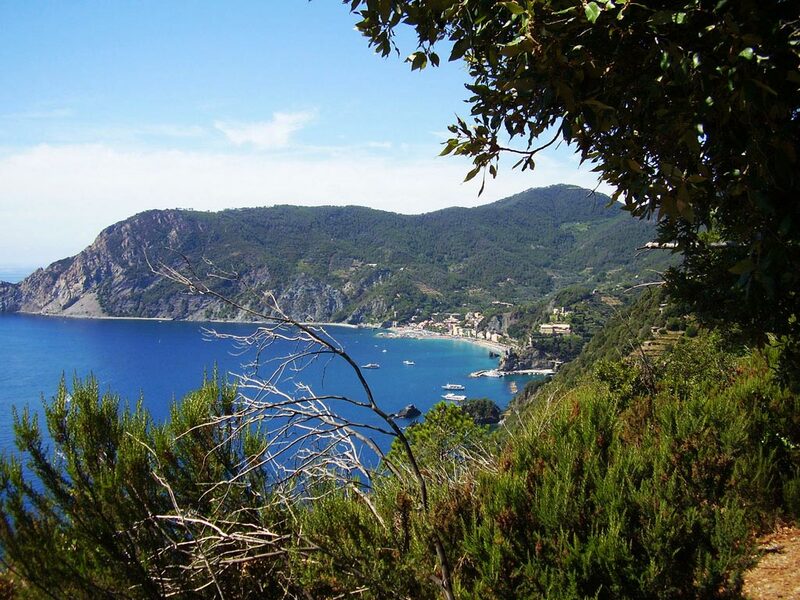 Then we continue through forested areas, along a dramatic coastline, with a number of impressive viewpoints, from where even the French Alps are visible. Then we descend towards the Romanic church of San Niccolò, set in beautiful scenery, and have a rest – and perhaps a swim – at Punta Chiappa, the most western point of the peninsula. 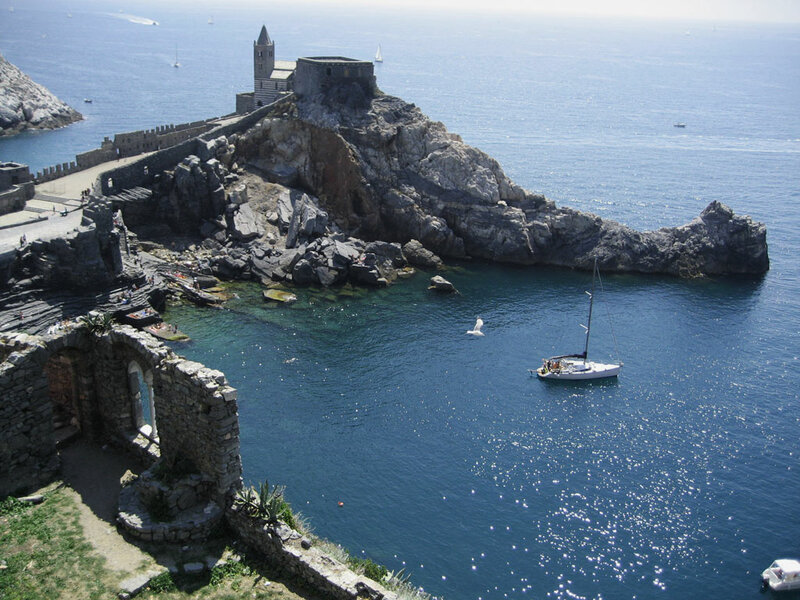 Then, from the pretty small harbour of Porto Pidocchio we take the boat to the beautifully located monastery of San Fruttuoso, dating back to the 11th century and set in its own cove, reachable only by boat or on foot. Here we can opt to make a short roundwalk, or relax on the beach. 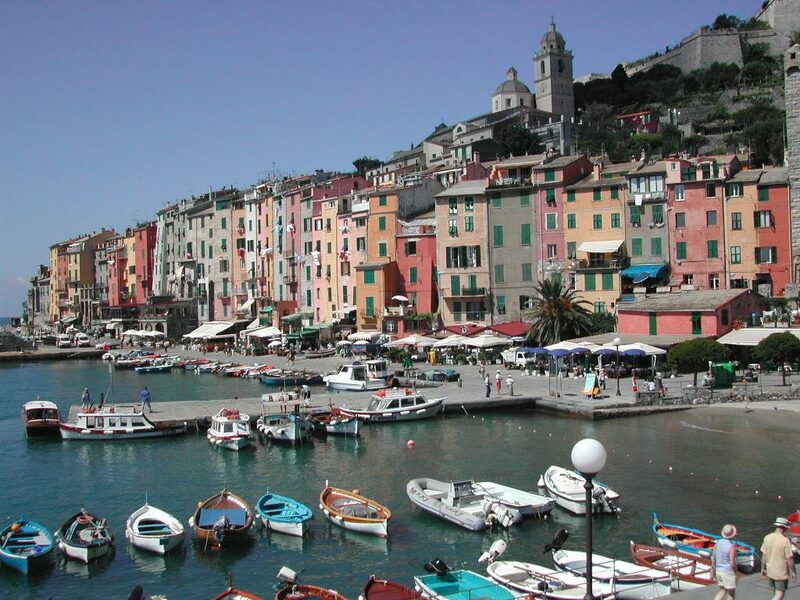 Then we take the boat back to Camogli, where we have some time to discover this beautiful small town, and have a drink at the colourful harbour. The boat ride back gives us the possibility to admire the coast also from another perspective. 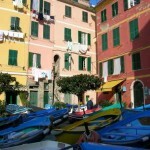 We start our walk today directly from Santa Margherita Ligure, gateway to Portofino. We first make a short walk through the historical centre, where we can also do some shopping for our lunch. We then start our walk into the hills and enjoy beautiful views across the bay. We pass through pretty forested areas, along a wonderful series of watermills and past beautiful villa’s. By late morning we reach Portofino, one of the most typical Ligurian seaside villages and a popular resort for the jetsetters. We explore this charming village and then take a break, in a great spot to enjoy whatever picnic lunch that we may have prepared for ourselves. 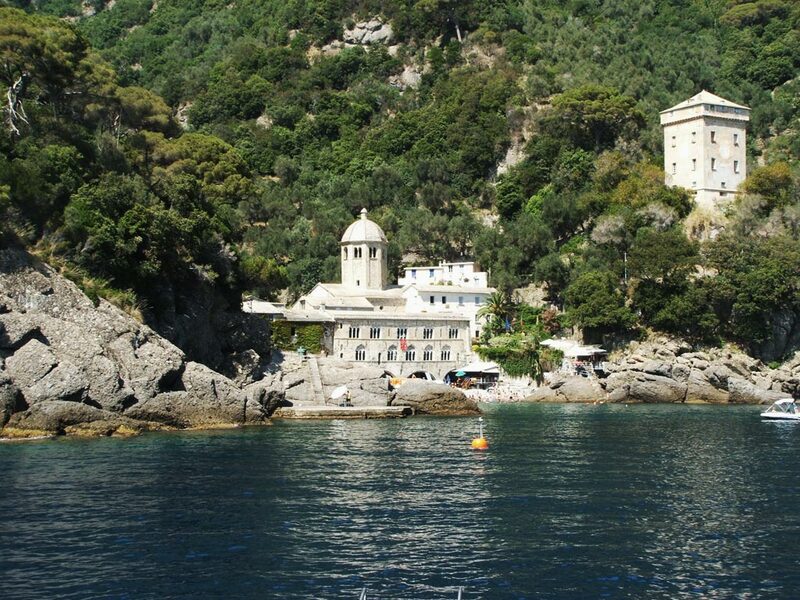 We next enjoy the stunning walk to the church & lighthouse, where we can look back on the inlet of Portofino, a name that means ‘fine harbour’. 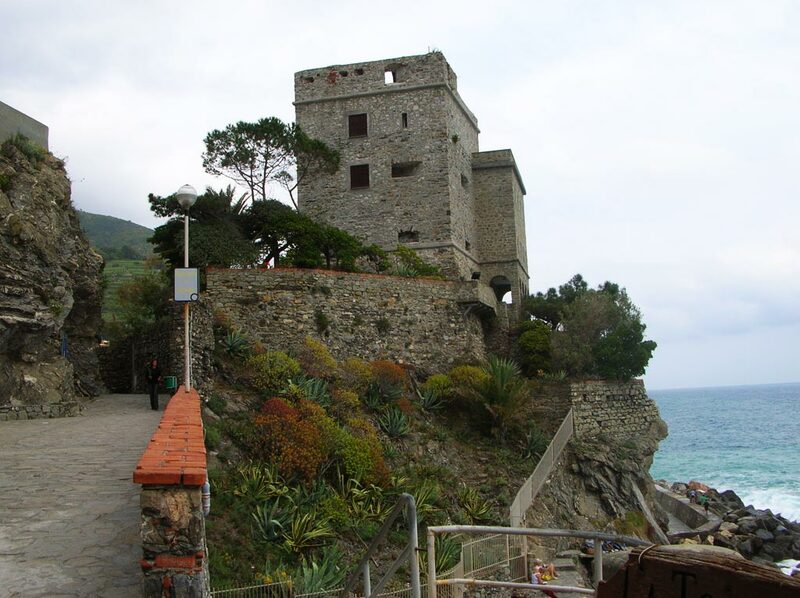 We can then opt to head uphill and walk on to the Abbey of San Fruttuoso, approaching this ‘jewel’ from the other end, along a path with splendid views across the Gulf of Genoa. 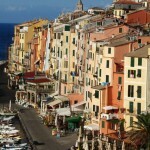 Or we can enjoy some free time in Portofino. 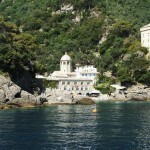 Then we return by boat to Santa Margherita, so that we can also admire this part of the beautiful coastline from the sea. Dinner is on your own tonight. 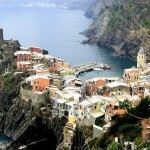 This morning we’ll transfer to the Cinque Terre! 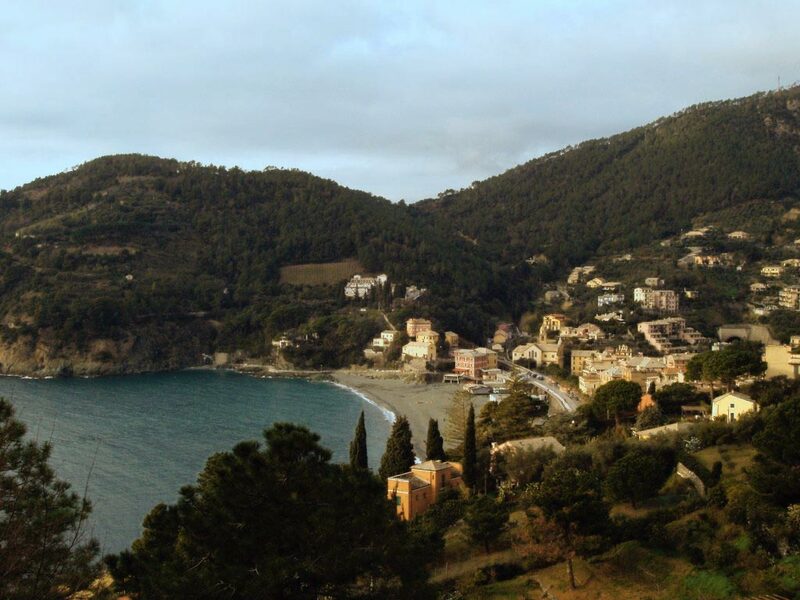 In the morning we pack all our things and take the train for a short ride to the nice coastal town of Monterosso, the most western of the five villages of the Cinque Terre. Here we settle in our beautiful hotel and then take our time to wander around through the historic centre and buy some picnic supplies. 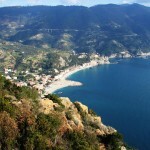 Then we start for a short, but beautiful walk, which leads us from Monterosso to Levanto, north of the Cinque Terre, featuring spectacular views up and down the coastline. The walk begins with a fairly steep ascent, but soon we enter a cool pine forest that leads up towards Punta Mesco, the most notable promontory in the region. This is a good spot to stop for a picnic lunch. Just short of the point we can make a small detour to the ruins of an old 11th century hermitage and a nearby ‘semaforo’ (beacon), from where we have sensational views of the rugged coastline. 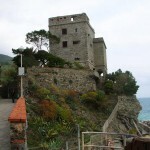 We then continue along forest trails around the point towards Levanto, before commencing the long gentle descent that eventually brings us into the southern end of the small town, behind the castle of Levanto. 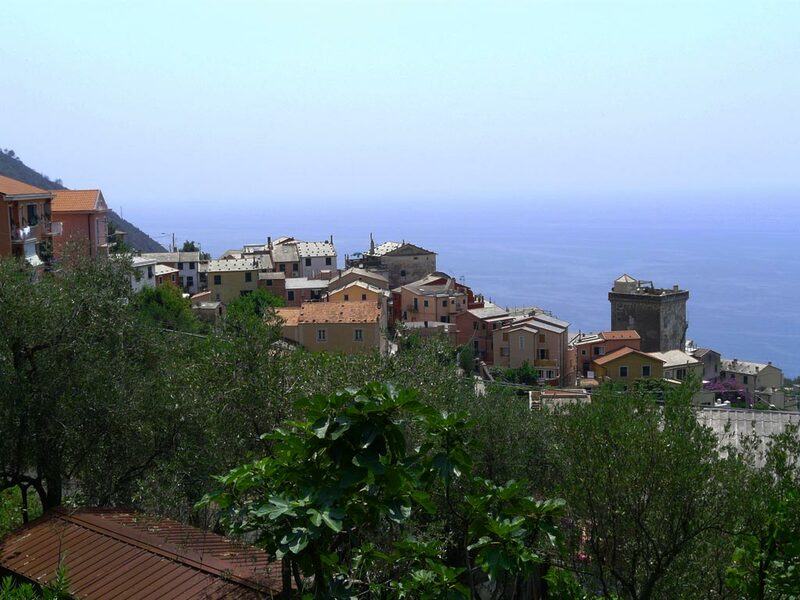 We now take our time to explore Levanto, and then we catch the train, which in a few minutes brings us back to Monterosso. 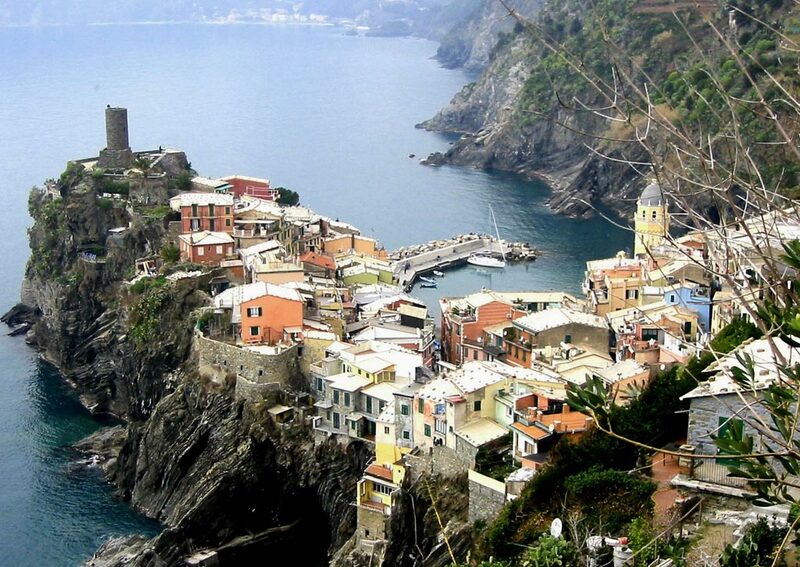 Today we walk the most famous path of the Cinque Terre, and may be of the whole of Italy, the so-called ‘Sentiero dell’Amore’. 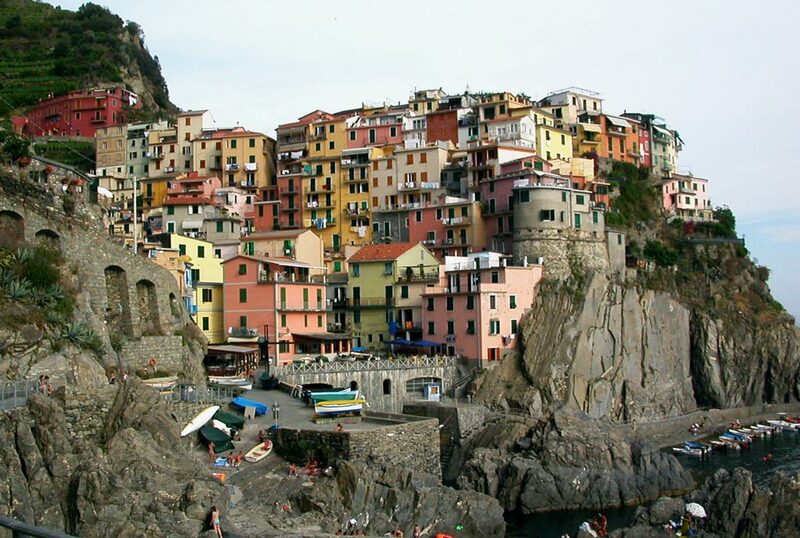 A short train ride takes us to Riomaggiore, the most southerly of the five villages of the Cinque Terre, from where we start the most famous of all walks in the area – the famous Sentiero dell’Amore (Lover’s Walk). 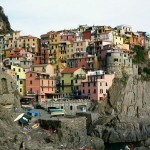 We begin at Manarola, an attractive little village with steep multi-coloured houses overlooking a rocky port. 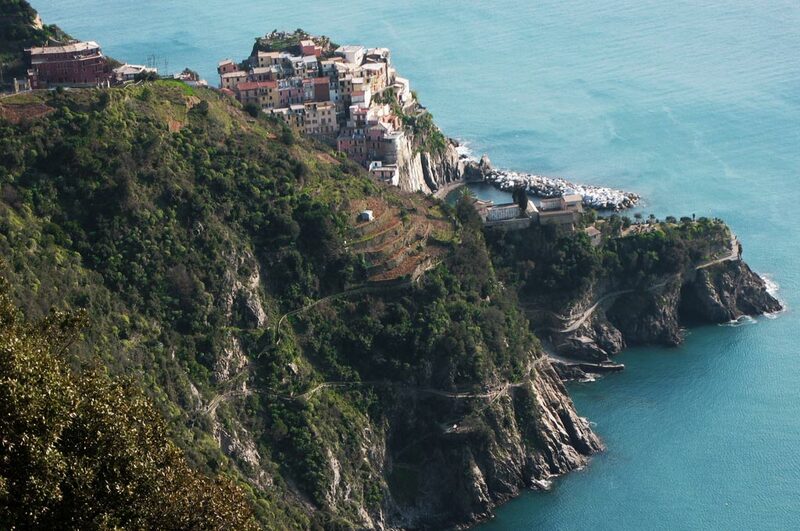 From here we make our way along one of the prettiest sections of the Cinque Terre, walking around the headland and heading up the 365 steps to Corniglia, perched on a ridge overlooking the sea. We continue our ascent to the little hamlet of Prevo, walking through terraced vineyards and the occasional citrus grove. 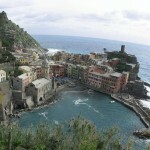 We enjoy some of the best views in the region as we approach Vernazza, dominated by its old fortress. We follow the contours of the hillsides on a narrow track that leads us up and down, before a fairly steep descent takes us into the village itself. Having a drink in Vernazza, on the wonderful town square at the harbour, resplendent with its brightly painted boats, is a good way to recover from this walking day. 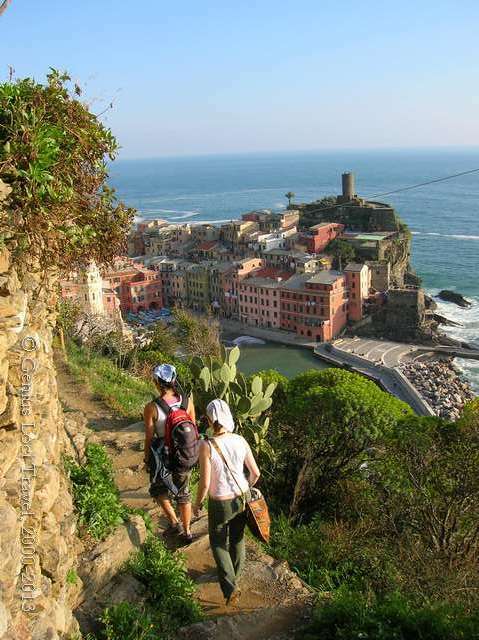 For those who want there is the possibility to continue the walk until Monterosso on foot, otherwise we take the train back, directly from Vernazza. In the evening we are free to go out for dinner in one of the typical local restaurants or pizzerias. 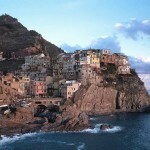 Our day starts again with a short train ride to Riomaggiore. Here we start our walk that leads us to Portovenere, at the very end of the peninsula, a long but enormously rewarding walk! We first catch an electric bus up to the sanctuary of the Madonna di Montenero (keen walkers can also climb up – a wonderfully scenic, but steep flight of stairs!). After a short rest at the sanctuary (with small bar & panoramic terrace! 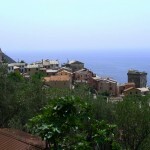 ), enjoying the spectacular views, we start our walk to Campiglia. Continuing uphill we follow the contours of the coastal cliffs, pass terraced vineyards and enjoy wonderful views of the coastline, framed by clear blue waters. Passing the abandoned village of Lemmen we walk to the Colle del Telegrafo, the highest point of our walk, where again we’ll find a bar for a rest. We then follow the long distance trail ‘Sentiero number 1, a ridge-top traverse that goes from one end of the Cinque Terre to the other. 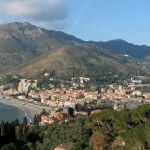 Through pleasantly cool pine forests, we descend to the little village of Campiglia. Here we can stop for lunch and some refreshment. 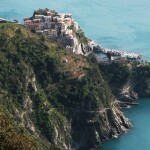 After lunch we continue towards Portovenere and enjoy more spectacular views. Arriving at the 16th Century castle above the village we may be able to catch a glimpse of the distant peaks of the Alpi Apuane, before descending on a long staircase that takes us to St. Peter’s Point and on into the heart of the village. After time to relax and explore Portovenere, one of the most charming coastal towns in Italy, we return by boat to Levanto/Monterosso, enjoying again some spectacular views, but now from below. Tonight we have a last great meal altogether, to say farewell to wonderful Liguria. The tour ends after breakfast today. By private taxi you are brought to the train station, from where it’s easy to reach any destination. A taxi transfer to any other destination can be arranged on request. Accommodation is on B&B basis, in all accommodations. Most evening meals are included, we have selected the best available restaurants. On one night you are free to choose from the wide choice of restaurants in the area. Your guide can give you good tips. Not all (picnic) lunches are included in the tour price, but these can be prepared for you by the accommodation holders, or materials for picnics can be purchased in the villages where you stay. On some occasions you have the option to have your lunch in a restaurant along the way. 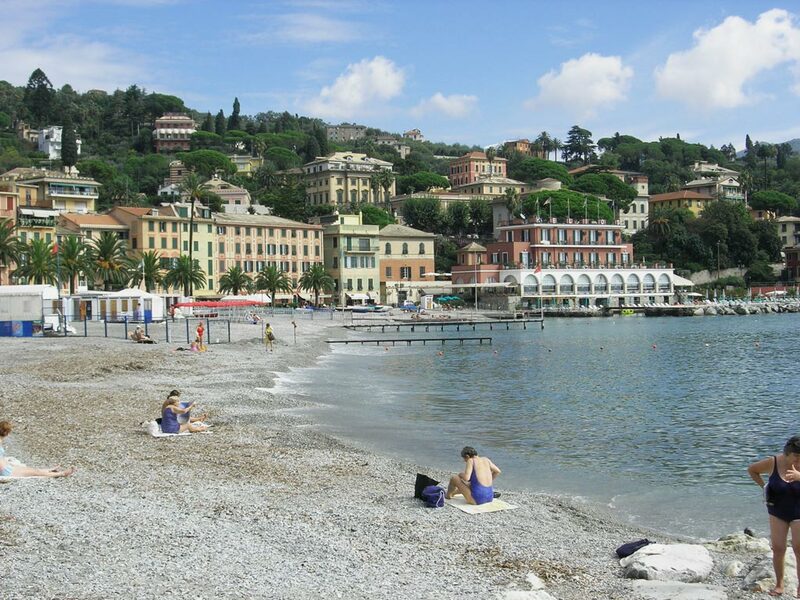 Nights 1, 2 & 3: These nights you stay in the romantic & fashionable Santa Margherita Ligure, the entrance gate to the Portofino Peninsula, with its characteristic painted houses built onto the steep slopes of the mountains. You stay in a beautiful 4-star hotel, centrally located. It is family-run and the friendly staff will make you feel at home. 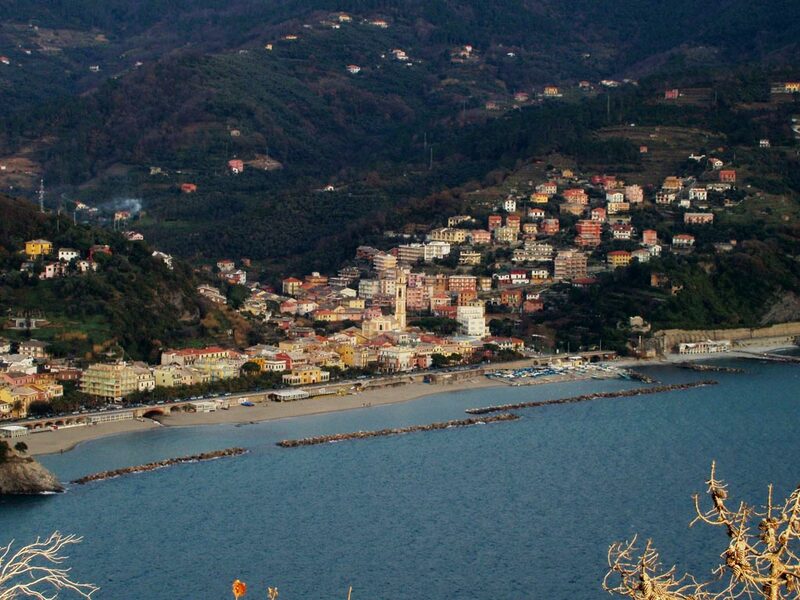 Nights 4, 5 & 6: The last three nights are spent at Monterosso or at Levanto, a charming medieval city with a great sandy beach and entrance gate to the Cinque Terre. Our recently renovated 4-star hotel is located in a great panoramic position. Arrival: The tour starts in SANTA MARGHERITA LIGURE, well connected with PISA & GENOVA (nearest international airports), as well as with Milan, Rome and all other major Italian cities by a frequent (high speed) train service. A taxi pick-up service can be arranged either from Pisa/Genova airport or train station. 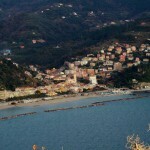 Departure: The tour ends after breakfast on day 7 in MONTEROSSO. A taxi will bring you to the train station, from where you travel to your next destination (all can easily be reached by train). Several taxi services are available to bring you directly to your next destination. It is possible to include extra nights at the beginning or the end of the tour. 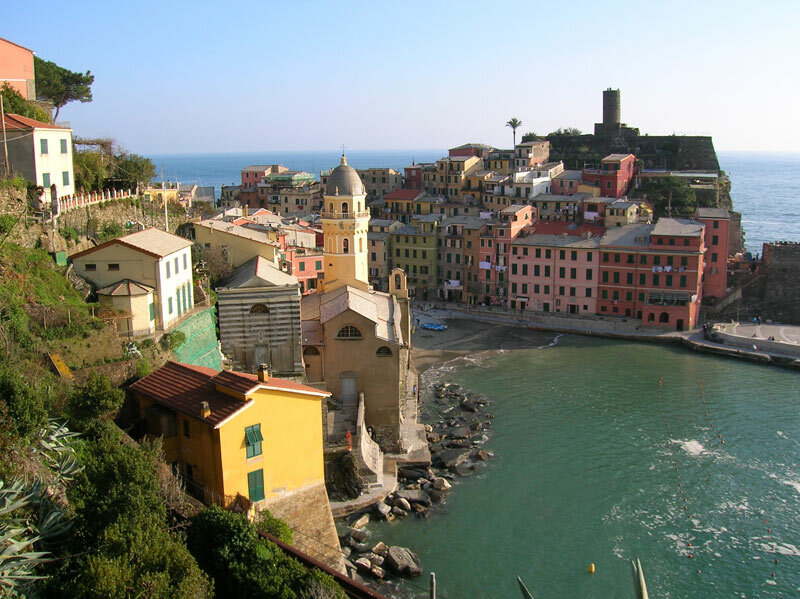 The tour can easily be extended with a few days in Genova, Portofino or Portovenere, on the Cinque Terre, or in Tuscany (see below). 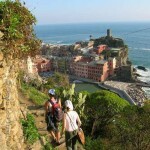 This tour covers the two main ‘hiking areas’ of Liguria: the Cinque Terre & Portovenere, as well as the Portofino Peninsula. 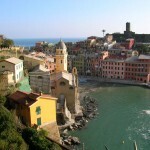 Slightly different tours (including Genova, or the area of Sestri Levante) can be organised. There are no scheduled departures for this tour in 2019, but on request a bespoke tour can be planned at any date – between late May and late September – for private groups. Just contact us! N.B. For this tour tailor-made private departures (for groups of minimum 4 persons) can be planned on any date. Availability & prices on request. Prices start from 1190 euro p.p., depending on the season and number of persons in your private group. It is possible to include some extra nights before or after your tour, in any of the accommodations ‘en route’. For those who have never been in Genova an extra day here is strongly recommended. At the beginning or the end of the tour there is also the opportunity to visit Florence and/or Pisa. The tour can easily be extended with a few days here. Also in MILAN or ROME several good accommodations are available. Details and prices on request. The tour can also be extended with a few days on a beautiful agriturismo in Tuscany, for some relax in the countryside. Several superb accommodations are available. Details & prices on request. On some dates we run an upgraded version of this tour, staying in luxurious 4-star hotels. Look for the ‘Premiere Inns’ signs. A shorter, 5-day version of this tour is also available. See also our other tours !